We believe that FlexPost™ is the safest concept to be introduced to hockey rinks since our development of the Megg-Net™ hockey goal system that dislodged on impact in 1984. Until now, absolutely nothing like it has been changed in hockey to increase player safety. At The Ice Rink Company, we think that manufacturers should not be content to just sell standard dasher board systems. Because major injuries from the cap rail are fast becoming an unacceptable bi-product of hockey, we worked hard to research and develop FlushMount™. A new concept to dasher boards, FlushMount™ Shield eliminates the inside ledge of the rink. This innovative product was our first step in removing what can be a concussion hazard. We are now proud to introduce FlexPost™, the next step toward player safety. FlexPost™ is a revolutionary new concept in glass and acrylic shielding supports. When a player hits the glass the support allows the glass to move away from the impact zone, and could help to alleviate the threat of a concussion or injury to the body. To create the FlexPost™, we took the rigidity of an aluminum shielding support and the strength and flexibility of a reinforced, state of the art, hot cured polyurethane; combined them at glass level and cured them in an oven at 225°C for 16 hours. The result is that IT WORKS. A simple concept, yet so effective. FlexPost™ is available as both a standard glass or acrylic shielding support and a FlushMount™ support for your dasherboard system. 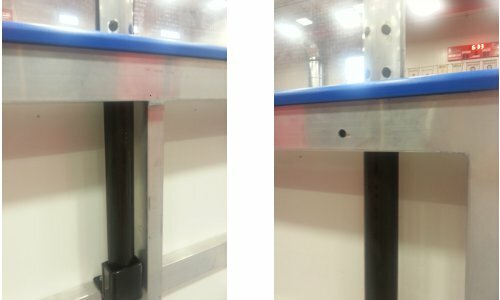 Why not make your hockey rink safer right now by simply changing your existing glass or acrylic shielding supports to FlexPost™ .